Obtaining and ingesting sources of nutrients from the environment are critical behaviors that all animals have to perform in order to sustain life processes. This simple unquestioned observation raises the question of the signals that trigger and then inhibit ingestive responses. The worldwide “epidemic” of obesity questions our understanding of the critical mechanisms that should permit adequate nutritional status. Scientific interest in the triggers of food intake (FI) is not novel. As early as the mid-nineteenth century, the physiologist Claude Bernard proposed key concepts in this area: the stability of the “internal milieu” is an essential condition for an animal’s “free and independent live” (Bernard 1879). The “internal milieu,” the internal environment of the organism, refers to the status of many crucial parameters (including body temperature, the fluid balance, blood pressure, and glycemia) that have to be maintained within narrow limits in order to maintain life functions. The notion of “homeostasis,” proposed by Cannon in the early twentieth century (Cannon 1932), refers to the convergent action of many physiological regulatory mechanisms that maintain the internal environment in a stable state. Regulatory mechanisms are well known not only in physiology. The thermostat that regulates the temperature in a room is a simple example of a regulatory system. A regulatory mechanism requires at least three elements: sensors that monitor the regulated parameter, a control center that compares fluctuating parameter values with the “optimal” one that is to be maintained, and effectors that can bring the deviant parameter back to “regulated” levels via a feedback loop. In physiology, all three elements can be immensely complex. Among the effector responses in particular, some are purely internal, such as the hormonal mechanisms that regulate the level of glycemia (insulin and glucagon) or the shivering response to cold. In some cases, their action is sufficient to restore the regulated status of the internal milieu, at least for a while; in other cases, however, their action is limited. When the organism needs energy, nutrients, fluid, or even oxygen, no internal response will adequately insure regulation. In those cases, behavioral responses are elicited by the control center, the brain, to obtain the required life-sustaining substances from the environment so that the vital parameters of the “internal milieu” can be maintained. If ingestive behaviors are effectors in regulatory mechanisms, what do they regulate exactly? This is a vast question to which the science of the last century has brought a large number of answers, well beyond the few classic parameters initially envisaged by the pioneers of homeostasis research. Actually, one increasingly pressing question, in the context of the worldwide epidemic of obesity, is whether FI actually regulates or dysregulates physiological processes. Even scientists who believe that ingestive responses are organized by the brain to serve physiological regulation are not so naïve as to believe that this is the whole story. Studies of spontaneous ingestive patterns in free-living humans have revealed that a large number of factors, sometimes quite unexpected, exert a significant influence on eating and drinking (de Castro 2010; McKiernan et al. 2009). Not only is FI not “regulated,” but it is constantly affected by a host of stimuli that often have nothing to do with the maintenance of critical vital parameters, when they do not simply antagonize it. In this chapter, two sources of scientific information will be examined. Firstly, the concept of homeostasis and its plethoric developments in the recent decades will be reviewed in order to illustrate the role of ingestive behaviors in physiological regulation mechanisms. 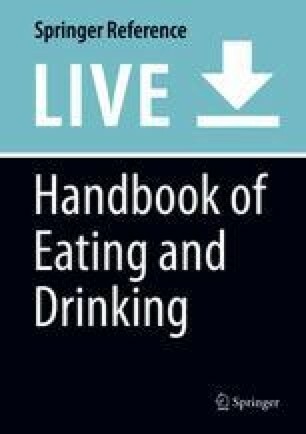 Secondly, studies investigating the spontaneous eating patterns of free-living humans will be reviewed in order to identify the determinants of behavior, among which markers of homeostatic regulation. The converging lessons from these two fields of science will help us analyze the regulatory and dysregulatory influences on ingestive behaviors and the reasons for our continuing failure to cope with obesity. Pioneer studies examined the role of ingestive behaviors in physiological homeostatic mechanisms. Early intuitions held that drinking was essential in the regulation of the body fluid balance and that eating was triggered by hunger in response to bodily needs. The nature of the “thirst signal” that triggers drinking was debated from the early twentieth century. The nature of the “hunger signal” also stimulated much research and debate. Early models proposed that a single factor was responsible for the periodic onset of eating. For all of the above hypotheses, and a few others, experimental demonstrations confirm that acute or chronic changes in the hypothetic “hunger signal” trigger or inhibit eating in animal models or human subjects. From a simply homeostatic perspective, eating can be triggered by a variety of changes in the internal milieu. The early homeostatic hypotheses stimulated the search for brain structures that could detect a critical deviation in one regulated parameter, compare it to a regulated value, and trigger the adequate physiological and/or behavioral corrective responses. Using the crude instruments available in the mid-twentieth century, a “hunger center” and a “satiety center” were identified in neighboring nucleuses of the hypothalamus (the lateral and the ventromedial nucleuses, respectively), whose activation/inhibition stimulated or inhibited eating. Of interest to the present discussion of regulatory mechanisms, animal works (Hoebel and Teitelmaum 1966; Powley and Keesey 1970) revealed that experimental lesions of the ventromedial nucleus (VMN), the “satiety center” of the hypothalamus, caused a change in the regulated body weight level rather than of eating behavior per se, so that lesioned animals would overeat only as long as their weight was lower than the new “set point” level, after which they would merely eat enough to maintain their elevated weight. This was an early experimental demonstration that food intake, rather than being regulated per se, acts as an effector in the regulation of body weight or body adiposity. Classic homeostatic views were used to account for the ingestive patterns of animals observed under laboratory conditions (Le Magnen 1992). Typically, animals with a continuous access to food do not eat continuously. Their ingestive patterns are organized in a series of discrete ingestive events (eating/drinking bouts) interspersed by intervals of variable duration during which no ingestion is observed. In addition, ingestion occurs mainly during the active phase of the species-specific activity cycle (night time in rodents, day time in humans). This pattern was termed the “dual periodicity” of ingestive behaviors (Le Magnen 1992). According to this classic view, at various moments of the activity phase, a critical “hunger signal,” arising from some homeostatic deviation, triggers meal onset. As consumption progresses, signals originating from various parts of the gastrointestinal (GI) tract cumulate and progressively counteract hunger and bring ingestion to an end. This process that brings eating to an end and therefore determines meal size is called “satiation.” Gastric distension and the release of “satiation hormones” such as cholecystokinin (CCK) triggered by the sensing of nutrients in the GI tract were identified as candidates to play this inhibitory role. Finally, consumption was thought to be inhibited following an eating episode by various post-ingestive and postabsorptive metabolic signals determining the duration of “satiety.” The succession of stimulatory and inhibitory influences was conceptualized in the “satiety cascade,” first described more than 30 years ago and periodically updated to integrate new findings (Blundell et al. 2010). Animal studies suggested that, after the fuels consumed in one meal had been used up by the organism, the critical hunger signal occurred again, in an all-or-none fashion, and triggered the onset of another meal (Le Magnen 1992). The analysis of eating patterns in laboratory animals quantified two important parameters of intake: the daily number of eating events and the size of these eating events. These two parameters could potentially vary in response to regulatory challenges in the environment, for example, when animals were exposed to cold temperature, to changes in palatability or energy density of their foods, or to forced physical activity (Le Magnen 1971). Laboratory rats housed in small individual cages with little else to do but eat, drink, groom, and sleep, were found very competent in energy regulation and generally maintained a stable body weight. Meal size was found to be highly sensitive to the palatability and variety of the available foods; in turn, larger meal sizes determined a longer duration of post-meal satiety so that longer satiety corrected for increased meal size (Le Magnen 1971). The “postprandial correlation” between meal size and duration of the post-meal interval suggests that animals with constant access to food adequately adjust FI to energy needs mainly by modulating the duration of post-meal satiety: animals do not return to their food before they have used up the energy consumed in their previous meal (Le Magnen 1992). A number of experimental situations, however, defeated the animals’ adaptation capacities: for example, lesions or stimulation of brain structures commanding ingestive behaviors induced either massive obesity or extreme life-threatening hypophagia, whereas exposure to a “cafeteria diet,” which consists in a continuous access to a variety of palatable foods typical of the human diet, stimulated ingestion and “dietary-induced obesity.” Domesticated animals notoriously show the same obesogenic sensitivity to their masters’ diet, and so do wild animals exposed to high-fat, high-sugar, and high-energy foods (Zheng et al. 2009). In addition, the celebrated ability of laboratory rats to adjust intake to changing energy conditions and maintain a “healthy” weight has proved to be limited to the usual duration of laboratory tests (a few days or a few weeks). When laboratory rats are allowed to age, they also tend to develop body adiposity, even when fed a boring laboratory chow. In the recent decades, the identification of regulated parameters and associated mechanisms has accelerated, facilitated by the phenomenal development of measurement instruments, such as brain imaging techniques. These major advances are beyond the scope of the present paper. Many excellent reviews of the cumulative findings have been published and are updated regularly (Berthoud et al. 2017). As a result of convergent progresses, the classic views of homeostasis and the role of ingestive behaviors have been entirely revisited. The next short sections address a few areas of specific relevance. The response to foods depends on the perception of their sensory characteristics by receptors in the head, but not only in the oral cavity. The perception of foods results from a complex integration of various sense modalities. The senses of taste and olfaction and also vision, audition, and proprioception (for the perception of texture and temperature) all contribute to the identification of foods and determine their rewarding or “hedonic” levels. Importantly, the responses of sensory receptors in the head contribute to both stimulation and inhibition of food intake. The stimulation due to palatability is highest at the beginning of ingestion. As foods are being consumed, habituation to the hedonic value of the ingested food develops. “Sensory-specific satiation” and “sensory-specific satiety” (Rolls and Hetherington 1989) are inhibitory processes that specifically reduce the reward value of the sensory characteristics of the ingested foods but spare the attractiveness of foods with other characteristics, thereby facilitating the consumption of varied food sources. Potential differences in sensory responsiveness between persons of different weight status are a continuing field of research. While recent studies have generally confirmed older data showing no difference in appreciation of foods (appetite for sweetness in particular) between normal-weight and obese persons, some studies suggest that certain aspects of appetite may be different: for example, satiation for sweetness at the time of ingestion might occur more slowly in obese than in normal-weight individuals (Pepino and Mennella 2012), possibly stimulating larger intake. One area of very rich scientific developments is the understanding of the sensors that respond to various parameters of the nutritional status in the GI tract and could contribute to regulatory signals. The entire GI tract is equipped with mechanosensors and chemosensors which can sense the volume and nutrient content of consumed food. For example, the same receptors responsible for the perception of sweetness in the oral cavity are found in numerous locations in the GI tract and signal the presence of sugars (Iwatsuki et al. 2011). The GI tract is densely innervated by sensory afferents of the vagus nerve, which are positioned to directly communicate nutritional information from the gut to brainstem structures (Berthoud et al. 2017). In addition to neural signals, the presence of food within the GI tract elicits the production of peptides and hormones that act locally to influence nutrient absorption and metabolism, and also directly in the brain to alter feeding behavior (Berthoud et al. 2017). As neural and hormonal satiation signals from the gut are generated during a meal, their impact gradually cumulates, ultimately activating brain circuits that cause individuals to stop eating, i.e., satiation (Woods 2009). Early views of gut signals insisted on their potent contributions to satiation and satiety. More recent developments established that the presence of nutrients such as glucose in the upper intestinal tract, and even in the circulation, can also act to condition food preferences and stimulate appetite and food intake. This phenomenon is called “appetition” to distinguish it from the satiation process by which nutrients in the gut suppress appetite and intake (Sclafani 2018). Importantly, the post-ingestive signals from the GI tract can be both stimulatory and inhibitory and require the brain to integrate possibly antagonistic influences. The brain is informed of the present status of the adipose stores in the body via the secretion of various hormones by the adipose tissue itself, among which insulin (Woods 2013) and leptin (Zhang et al. 1994), allowing lipostatic mechanisms to influence behaviors. The status of the adipose stores in the body modulates the response to sensory factors such as palatability. For example, after weight loss, regulatory processes enhance the attractiveness of sensory signals so that more is consumed, progressively restoring the original level of body adiposity. This process is reflected in the activity of the “hungry brain” after weight loss, in which activation patterns are enhanced in response to food, a change that can be antagonized by the administration of leptin (Zheng et al. 2009). One important adaptive skill of animal life is the capacity to learn. Animals can learn from previous experiences and adapt their responses to environmental cues in order to anticipate situations of need and minimize the impact on their vital functions or to avoid them altogether. Learning shapes both behavioral and physiological responses. The conditioned reflex, whose mechanism was demonstrated at the beginning of the nineteenth century (Pavlov 1927), is one extremely useful tool in an animal’s regulatory arsenal. The brain associates stimuli that occur in contiguity in the environment, so that one (e.g., Pavlov’s bell) reliably predicts another (e.g., the meat served to Pavlov’s dogs). As a result, predictive conditioned stimuli acquire the capacity to elicit adaptive, homeostatic responses in anticipation of the contact with unconditioned stimuli. Animals in the wild and humans living in organized societies learn to anticipate eating occasions in their particular environment. The circumstances of habitual food intake, the time of day, the smell and sight of foods, become conditioned stimuli that trigger a set of anticipatory metabolic reflexes before ingestion has even started in order to facilitate the absorption of nutrients by the body. This phenomenon is known as the “cephalic phase” of digestion (Powley 1977). Among many aspects, a neurally elicited insulin secretion occurs before or at the very beginning of meals (Teff 2011). The cephalic-phase insulin secretion in humans is small in magnitude, but its occurrence at start of meals is sufficient to minimize the metabolic deviations that follow the meal and enhance nutrient assimilation (Woods et al. 2018). Un-signaled meals or snacks result in higher postprandial hyperglycemia due to the lack of a cephalic-phase insulin response (Chapelot et al. 2004; Teff 2011). Other reflexes of the “cephalic phase” affect many other hormones and enzymes that aid the digestion and absorption processes. A common feature of these conditioned anticipatory responses is that they occur in the absence of any major deviation of regulated parameters; they act to prevent it or at least minimize its effects. An efficient regulator, animal or human, does not wait for critical situations to develop and uses prior experience to avoid or minimize need states (Ramsay and Woods 2016). At the behavioral level, learning shapes an individual’s hierarchy of food likes and dislikes, based on the association of sensory characteristics of foods with post-ingestive effects. Importantly, in the context of a discussion of regulatory influences, the appropriate amount of a particular food to ingest under particular need states, present or anticipated, is learned based on repeated experiences of the nutritive properties of the food: appetite and satiety are conditioned responses (Booth 1977). Ingestion stops long before most nutrients are digested and absorbed: learned associations between sensory cues and post-ingestive satiety allow an individual to stop eating with the assurance that sufficient calories have been acquired (Woods 2009). In much the same way, instrumental responses are learned to allow an animal or human to make optimal use of the resources of the environment and obtain a supply of food (via hunting, gathering, or shopping) before vital parameters deviate from life-sustaining levels. Ingestive responses to homeostatic deviations do occur, for example, when blood glucose is severely reduced (Langhans 1996). However, eating most often happens at glucose levels considerably above critical values (Woods 2009), and most regulatory responses occur without using negative feedback (Somjen 1992). As any learned responses, anticipatory regulatory responses are plastic as opposed to hard-wired reflexes (Woods 2013). Even the satiating action of digestion-related hormones (such as CCK) is actually a plastic conditioned response rather than a hard-wired unconditioned response. It is therefore subject to the process of extinction or modulation if ingested substances do not contain the expected amount of energy (Woods et al. 2018). The progresses of brain imaging techniques have allowed major advances in the identification and understanding of brain regulatory mechanisms. The hypothalamus together with the corticolimbic system and the hindbrain can be seen as the core processor in the control of appetite (Berthoud et al. 2017). The brain receives a continuous stream of diverse signals regarding the energy status throughout the body and monitors the entry of nutrients into the blood and their utilization by most tissues (Woods 2009). At the time of meal, the brain integrates signals reflecting energy input with the present and anticipated state of need and acts as a “homeostatic regulator,” adjusting intake to needs in a flexible, largely anticipatory manner. Brain mechanisms at times must arbitrate among multiple possibly conflicting regulatory responses. For example, if chronic glucopenia is created in experimental animals, energy intake increases to maintain blood glucose even if the augmented energy intake induces significant weight gain (Langhans 1996): although both body adiposity and blood glucose are regulated parameters, protecting acute blood glucose levels takes priority over body weight control (Woods 2009). The reward or hedonic value of food is represented in the brain. Food reward is a composite process that includes “liking” (hedonic appreciation), wanting (incentive motivation), and learning (reward value based on associations and predictions). All occur together, but the three components have separable brain systems (Berridge et al. 2010): conscious liking in humans is encoded in the prefrontal cortex; wanting is encoded by the mesolimbic dopamine system mainly projecting to the nucleus accumbens in the ventral striatum. Liking is relatively independent of the prevailing nutritional state. By contrast, wanting is greatly amplified by hunger (Berthoud et al. 2017), and satiety dampens the stimulatory impact of food cues (Berridge et al. 2010). Several brain regions and neurochemical systems mediate conditioned preferences based on postoral nutrient sensing (Sclafani 2018). Dysfunction in reward circuits might contribute to dysregulated eating and the rise of obesity, although it is still unclear whether the possibly faulty circuits are hypersensitive or hyposensitive to food reward. Eating can be triggered by metabolic need, hedonic drive, or an interaction between the two, and there are several neural circuits that represent this interface. Metabolic signals of energy status modulate processing of cognitive and reward functions in corticolimbic systems (bottom-up processing), which influence regulatory processes including ingestive responses (Berthoud 2011). In turn, cognitive functions are capable of organizing food acquisition and consumption in order to optimize nutritional benefits, for example, when planning meals or finding information about the nutritional value of foods. In other circumstances, however, the cognitive and emotional brain can override homeostatic regulation (top-down processing) to yield an energy imbalanced state (Berthoud 2011). As a result of these major scientific developments, it is now recognized that, in order to be efficient, an animal’s vital regulatory system requires complex and redundant nutrient sensing and monitoring mechanisms, a flexible integrative mechanism that can learn from and adapt to changing external and internal conditions, and powerful effector mechanisms for energy intake and metabolism (Berthoud et al. 2017). The human organism is equipped with such highly competent mechanisms. The modern vision of regulatory mechanisms acknowledges that FI participates in the regulation of numerous internal parameters of vital importance. The ingestive responses are triggered, however, not only by simple feedback loops that correct an acute state of need or excess but, more generally and more efficiently, in an anticipatory fashion, after an organism has become accustomed to a predictable environment. States of need or excesses can be anticipated and partially or totally avoided, thereby insuring the stability of the internal milieu. How do actual ingestive behaviors in free-living individuals respond to these various mechanisms? A number of methods developed over the years have investigated ingestive patterns in free-living humans and identified conditions or factors affecting the number of daily eating episodes, their size or duration, and their satiety effects. In particular, they examined the influence of thirst and hunger or other factors potentially reflecting regulatory needs. These methods require consumers to report all their consumption episodes over a number of days. In addition to what typical dietary surveys include, these methods obtain information about various circumstances of consumption, for example, time of day, day of the week or month, company sharing the meal, context, and palatability. In many cases, visual analogue scales (Stubbs et al. 2000) or other validated instruments that assess facets of appetite (hunger, thirst, fullness, desire to eat or drink, etc.) provide insights into subjectively experienced states of need. The “Weekly Food Diary” method examines ingestive patterns over a whole week and computes a correlational analysis of the relationships between ingestive events (de Castro 1994). A different approach consists in gathering hourly appetitive ratings and dietary recalls for 7 consecutive days (McKiernan et al. 2008b). Such reports quantify the number of daily eating events (meals or snacks), the amount of energy/nutrient/fluid ingested in each event, the duration of consumption, and the duration of pre- or post-intake intervals. These studies reported many unexpected observations. First, they provided little support for the intuitive notions that thirst is a major stimulus of drinking and that eating is a response to hunger states. A weak coupling appeared between the sensations hypothesized to signal biological need states and ingestive behaviors distributed over the waking hours. In a review covering 39 dietary surveys, it appeared that most (64%) did not observe any significant association between appetite ratings and actual intake (McKiernan et al. 2008b). Hourly reports revealed that patterns of hunger are only weakly predictive of energy intake (r = 0.30) and patterns of thirst fail to predict energy intake or fluid intake (r = 0.08 and r = 0.03, respectively) (McKiernan et al. 2008b). In Weekly Food Diaries, the intensity of hunger sensations recorded at the beginning of a meal and the duration of the interval since the previous episode of intake (an objective measure of food deprivation) show significant but very modest associations with the size of the meal, accounting for only 4–9% of the variance in meal size (de Castro and Elmore 1988). One internal factor, the estimated stomach contents at the beginning of consumption, shows a negative correlation (de Castro 2010) with the size of the meal. The correlation, however, accounts for less than 6% of the variance in meal size. About 75% of all fluid intakes occur at the time of eating (McKiernan et al. 2009). The sensation of thirst at meal time is only weakly associated with total fluid intake. Relatively rare drinks occur independent of eating and are correlated with the degree of thirst (de Castro 1988). Drinking without eating leads to a decrease in thirst sensation whether or not the beverage contains energy; however, drinking without eating does not induce any reduction of hunger even when the beverage contains energy (McKiernan et al. 2009). Beside these modest correlations with appetite sensations, the amount of energy consumed in one eating event is significantly affected by external factors such as time of day and day of the week and by the number of persons sharing the meal (de Castro 2010). The “social stimulation” of eating is a robust observation that varies qualitatively as well as quantitatively. Different social interactions (parental, friendship, work, etc.) affect meal intake in potent and complex ways (Herman 2015). Meal size appears to be a power function of the number of persons present. However, the magnitude of the correlation remains modest, accounting for 9% of the variance in meal size (de Castro and Brewer 1992). Time of day is a major factor affecting daily eating patterns. Energy intake is not distributed evenly over the waking hours: meal sizes increase from morning to night. Breakfast, which occurs after the long overnight fast and in the most acute state of need, is often a relatively small meal. Satiety, the inhibition of ingestion induced by prior consumption, is not a stable phenomenon over the waking hours but rather seems to decrease in efficiency from morning to night. Breakfast produces relatively long-lasting satiety. As the day progresses, average meal size increases and intermeal intervals get shorter. Importantly, there is no evidence of adjustment of energy content, or compensation, on a meal-to-meal basis: no significant correlation appears between the size of a particular meal and the size of subsequent meals (e.g., a large lunch is not necessarily followed by a small diner) (McKiernan et al. 2008a; de Castro 2010). Another important aspect of ingestive patterns relevant to regulation is that food intake varies considerably from day to day (de Castro 2010). If the internal milieu must be kept constant, homeostatic mechanisms should compensate for these variations and adapt intake in response to a prior day’s deficit or surfeit. Many studies report that correlations between 2 successive days are not significant (de Castro 1998). However delayed compensatory adjustments can be observed after 2 or 6 days and appear to be macronutrient specific (De Castro 1998; Champagne et al. 2013). These observations are consistent with the 2–3-day delays in adjustments in FI following changes in physical activity (Edholm et al. 1955). Each macronutrient exerts a maximal negative relationship with subsequent intake of that same macronutrient with 2-day lag (de Castro 1998). The 2-day delay eliminates acute GI, plasma, and hepatic factors as intermediaries. Rather it suggests that feedback from a long-term energy storage depot (fat) may be involved (de Castro 1998). Once more, these significant compensatory effects are small and account for less than 5% of the variance in daily intake (de Castro 2010). According to the General Control Model proposed by de Castro (2010), external factors such as daily, weekly, or seasonal rhythms, social facilitation, dietary restraint, cost and availability of food, palatability, energy density, culture, beliefs, etc. contribute to the control of ingestive behaviors along with a large number of internal compensated factors with regulatory feedback loops, among which stomach contents, blood glucose, free fatty acids, leptin, body weight, body fat mass, temperature, insulin in the central nervous system, and hypothalamic neuropeptide-Y concentrations (de Castro and Plunkett 2002). Each of these factors exerts a minute influence, although it may be significant in correlational analyses. The influence of any one factor can only be understood when considered in combination with many, if not most or all, of the other influential factors (de Castro 2010). Dietary reports in America and many European countries show that two to three main meals plus two to four snacks or more occur on most days in most adults and children (Bellisle 2014). FI occurs every few hours, when no major state of need has developed. Humans also work, study, commute, watch various screens, enjoy diverse forms of leisure activities, and devote time to family and friends. Time has to be shared between numerous activities, obligatory and/or optional. When to eat appears largely dictated by environmental and social constraints, especially time of day (socially determined time of main meals, time when foods are available for snacking). Actually, in the twenty-first century, it may be more appropriate to say that time used to be shared between so many different activities: nowadays eating is often done while doing something else (e.g., watching various screens) (Kahneman et al. 2010). Cultural differences modulate this overlap of eating with other activities: in America eating is often considered an accessory activity that is compatible with other “main” activities, whereas in France eating is reported as the “main” activity that sometimes can be contemporary with other compatible behaviors (Kahneman et al. 2010). While the influence of significant regulatory factors appears to be modest in studies of eating patterns, it is likely that this modest influence can be diluted if FI itself is just one feature, and maybe not the main one, of the attention-requiring activities. Ample evidence has been obtained of the deleterious effects of distraction at the time of eating on both satiation and satiety (Higgs and Spetter 2018). Surprising as it may seem, the action of regulatory factors, among this plethora of diverse and often antagonistic influences, is detectable. It is evidenced by the modest energy and nutrient-specific compensation phenomena observed over several days (discussed above) and also by the relative stability of body weight over long periods of time in most adults. Weight stability reflects a state of energy balance at all levels of the body adiposity spectrum; in overweight/obese individuals, this is achieved at a higher level of body fat (Hall et al. 2012), confirming very precise regulation. In many populations, however, body adiposity has increased to unprecedented levels in recent years, suggesting a strong positive balance and faulty regulation. Using a population-averaged model, Hall et al. (2011) established that the development of the obesity “epidemic” in American adults resulted from a small persistent average daily energy imbalance gap between intake and expenditure of about 30 kJ per day, a very small positive but cumulative deviation. How can obesity develop then, if adiposity regulation remains active? Animal and human studies show that body adiposity regulation is asymmetrical: while the procurement of sufficient energy and nutrients are strongly defended, preventing decreases of body adiposity, the homeostatic defense of upper limits of adiposity is under no such critical constraints (Zheng et al. 2009). The critical pressure against elevated body weight during evolution is thought to be vulnerability to predation, a problem that has lost its selection power as human societies developed very efficient protection (Zheng et al. 2009; Speakman et al. 2011; Rogers and Brunstrom 2016), allowing body weight to drift upward progressively. The long-standing and successful efforts of sapiens to secure protection from famine, on the one hand, and from predators, on the other hand, have led to a progressive increase in body size over, at least, the past 300 years (Caballero 2019). The obesity “epidemic” of the recent decades is not a novel phenomenon but rather the ultimate development of this trend, facilitated by major social and economic progresses (Caballero 2019). Given the changing survival pressures in human societies, a genetic drift may have allowed a progressive increase in the adiposity set point (Zheng et al. 2009). In addition, numerous aspects of modern lifestyle contribute to making FI escape the moderating influence of regulatory factors. Clearly, many of these factors are associated with food and eating patterns, for example: increased availability of palatable energy-dense foods; increased exposure to food cues; increasing portion sizes; increased variety of food options, more frequent eating outside the home; low-cost of high-fat, high-sugar foods and sweetened beverages; reward from comfort food; distracted mindless eating while watching one of many screens. The general increase of obesity in the American population, affecting all ages and social strata, has been attributed to the sudden increase in food supplies that took place first in the USA in the second half of the last century (Rodgers et al. 2018). A “vicious circle” effect is possible: over-ingestion of high-fat diets can rapidly produce hypothalamic inflammation and damage, causing the adiposity set point to change (Thaler et al. 2013). Other suspected obesogenic influences derive from non-food-associated aspects of lifestyle: decrease in energy expenditure below the point where it can exert a moderating influence on intake, use of artificial light and disturbed sleep patterns, screen exposure, central heating, disturbance of the microbiota, and cumulative epigenetic vulnerability developed in successive generation of sedentary pregnant women, among others. As a likely consequence of the above obesogenic influences, it is now common in most developed societies that at least half of the adult population is either overweight or obese. It should not be overlooked, however, that the other half is not obese, in spite of the shared environment and the plethora of anti-regulatory influences. Individual risk factors for obesity are the focus of very active research, among which the many genetic variants that differentiate the obese from the nonobese (Speakman 2007). Many genes affect food selection, food intake, absorption, metabolism, and energy expenditure, including physical activity. Genetic factors modulate the response to most of the internal and external factors identified in analyses of free-living ingestive patterns (de Castro 2010). Of interest also is the strong social gradient observed in developed societies, with decreasing rates of obesity as income and education increase (Pavela et al. 2019). What makes certain social strata relatively immune to obesity deserves to be investigated: food choices and habits are different according to socioeconomic factors, while other aspects of lifestyle (access to sports and medical care) have the potential to make a significant contribution. Such differences could, at least hypothetically, facilitate a higher sensitivity to regulatory influences. The study of regulation mechanisms has stimulated spectacular developments in many scientific fields: sensory physiology, digestive physiology, behavioral science, psychology, and brain structure and function, among others. Much has been learned. Food intake, in its immense complexity, is one important effector in the regulation of several important parameters of the internal milieu. The naïve view that hunger triggers eating while thirst prompts drinking finds little support in scientific reports of present lifestyle, perhaps because states of physiological need can be prevented by anticipatory intake responses. Regulatory responses to energy or nutrients needs are not perceived at the scale of 1 day. However, evidence of regulation becomes clearer when intake and weight are followed over longer periods. The classic notion of a fixed body weight set point preventing and/or reversing weight losses and gains has been replaced by the notion of a flexible regulator that learns from experience and adapts to changing environmental conditions, resulting in a “floating set point” (Zheng et al. 2009) that resists adiposity decreases but is very prone to increases under the influence of nutritional and non-nutritional influences in the obesogenic world. The obesity “epidemic” in modern societies does not rule out the action of powerful regulatory mechanisms acting in present lifestyle conditions. Procurement of energy and nutrient to cover bodily needs are strongly defended, while an asymmetrical regulation of body adiposity stores allows a progressive upward drift of body weight in large segments of contemporary populations. Clearly, numerous nutritional and non-nutritional influences make body adiposity regulation difficult and imprecise. An important question remains of the critical factors that allow so many people to maintain a healthy weight under the very same obesogenic conditions. The contribution of FI, under genetic or socioeconomic influences, to these differences remains to be examined in this context.